Please join us for this special hands-on workshop with Richa Nagar. The workshop, to be led by Nagar, will focus on internalizing the practice/politics/poetics of radical vulnerability. To get the most out of the workshop Nagar has requested that participants read two short interviews, linked below. During the workshop we will draw on concepts that Nagar has developed to reflect on our own intellectual projects and epistemological/political struggles related to building alliances across scholarship and everyday lives and struggles. The readings offer a backdrop for the deeper hands-on work that we will do together. An conversation about friendships, collaborations and alliance work between Nagar and “The Toronto Group” that appeared in Feminist Studies. Richa Nagar is Professor of the College in the College of Liberal Arts at the University of Minnesota, and currently holds a Russell M. and Elizabeth M. Bennett Chair in Excellence and a Beverly and Richard Fink Professorship in Liberal Arts. Her multi-lingual and multi-genre research and teaching blends scholarship, creative writing, political theatre, and community activism to build alliances with people’s struggles and to engage questions of ethics, responsibility, and justice in and through knowledge making. Richa’s co/authored or co/edited books in Hindi and English include: Sangtin Yatra: Saat Zindgiyon Mein Lipta Nari Vimarsh (2004), Playing with Fire: Feminist Thought and Activism through Seven Lives in India (2006), A World of Difference: Encountering and Contesting Development (2009), Critical Transnational Feminist Praxis (2010), Ek Aur Neemsaar: Sangtin Atmamanthan Aur Andolan (2012), Muddying the Waters: Coauthoring Feminisms Across Scholarship and Activism (2014), and Main aur Mera Man: Sharad Nagar (2016). Richa was a fellow at the Center for Advanced Study in the Behavioral Sciences (CASBS) at Stanford in 2005-2006 and at the Jawaharlal Nehru Institute of Advanced Study (JNIAS) at New Delhi in 2011-2012. Her home department is Gender, Women, and Sexuality Studies. This entry was posted in Uncategorized on May 16, 2017 by chsims. 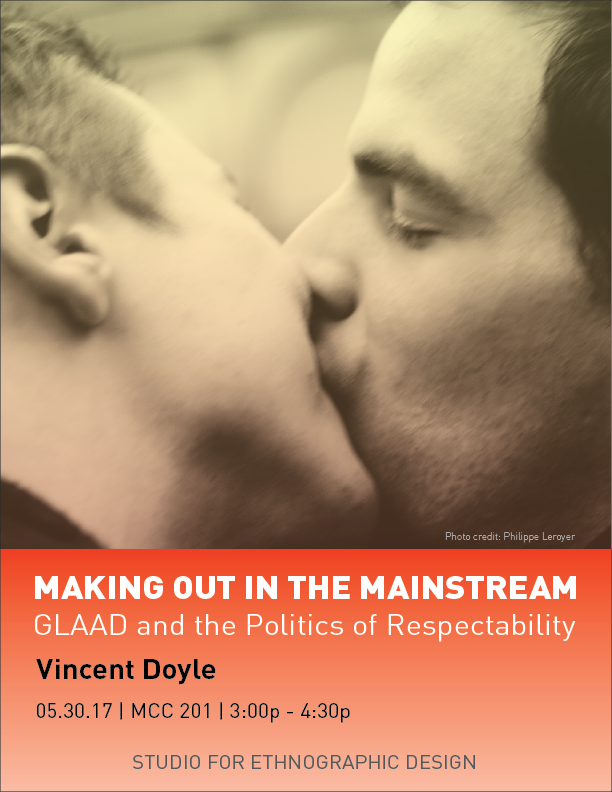 Making Out in the Mainstream is the first full-length study of the rise and evolution of GLAAD, the media advocacy organization formerly known as the Gay and Lesbian Alliance Against Defamation. Founded in 1985 by a small group of writers and academics who were angry with how the New York Post was covering the AIDS crisis, GLAAD has become one of the most visible organizations of the LGBTQ movement. This book is based on eighteen months of ethnographic fieldwork carried out in 2000–01 and a further round of interviews conducted in 2014-2015. Doyle argues that the earlier strategy of coming out to the mainstream, intended to dismantle closeted life and create a mass movement, has been supplanted by the market-oriented making out in the mainstream, which privileges respectable images of homosexuality in the pursuit of political and economic gain. He shows how this emphasis on respectability clashes with the development of a diverse movement that campaigns for greater inclusion and he offers a sophisticated appeal for more complicated understandings of assimilation and anti-normalization. Painting a complex portrait of a prominent gay and lesbian organization during a period of rapid societal change, Making Out in the Mainstream reveals not only the limitations of “mainstreaming,” but also its political possibilities. Vincent Doyle is the Academic Director of the Master in Visual and Digital Media (MVDM) at IE University (Spain). Originally from Ottawa, Canada, he holds a PhD in Communication from the University of Massachusetts, Amherst (USA), and an MA in Communication from McGill University, Montreal (Canada). He is a Fellow of the Sexuality Research Fellowship Program of the US Social Science Research Council (2000) and has received two top paper awards from the International Communication Association. Prior to his appointment at IE University, he was Visiting Assistant Professor of Media and Cultural Studies and Andrew W. Mellon Foundation Post-Doctoral Fellow at Macalester College, St Paul, Minnesota (USA). This entry was posted in Uncategorized on May 9, 2017 by chsims. Is journalism today better than it has ever been? The question, on the surface, seems ridiculous. Fox News and Breitbart.com dominate our political discourse. A reality-television show star leveraged the affordances of cable news to vaunt himself into the Presidency. Newspaper circulation numbers and journalist employment levels are dropping. Nevertheless this talk will argue that, at certain elite publications, a lot of journalism is more accurate, more quantitative and more explanatory than ever– and this elite journalism, paradoxically, matters less than ever to American political discourse. 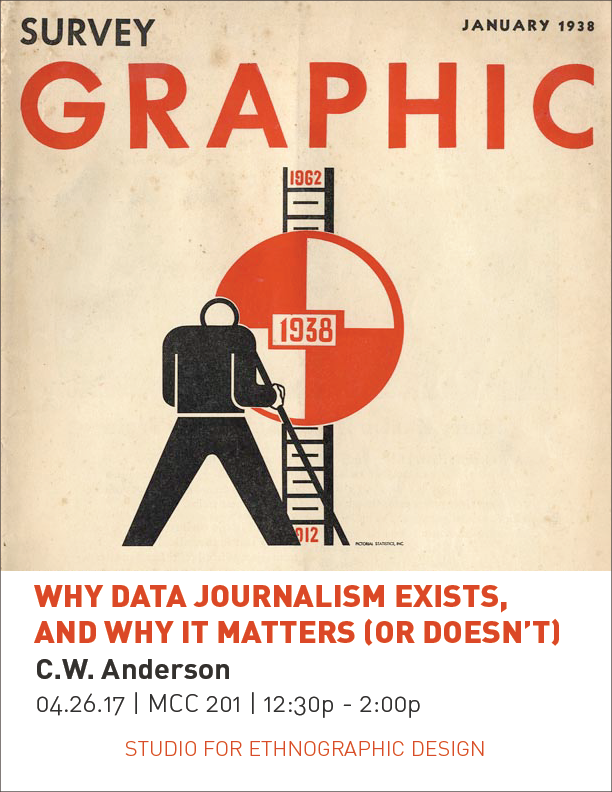 This talk tries to get at these issues by taking a trip back into the recent past, and examining the origins of our modern form of quantified journalism. It outlines five reasons why data journalism exists in its present day form, reasons that lead back to the intellectual dynamics of the 1960s and 1970s. I look at (1) the work of the Russell Sage Foundation, Columbia University, and the University of Wisconsin in promoting the “social sciences in the media” initiative in the early 1960s; (2) an emerging vision of computers and databases that allowed them to be integrated into journalistic work; (3) changing notions of what was meant by “investigative reporting” in the 1970s; (4) academic developments in journalism schools; and (5) a long-term crisis in notions of journalistic objectivity in the 1960s, in part prompted by the emergence of “the new journalism” at about the same time. Beyond simply complicating our understanding of the sociology of data journalism, this more nuanced history allows us to better understand why data journalism has achieved such prestige today, why it nevertheless remains an outlier in most newsrooms, and how it has navigated the larger crisis in objective knowledge production gripping not only newswork but academia in general. C. W. Anderson is Associate Professor at the College of Staten Island (CUNY); as of the Fall of 2017 he will be a Professor of Media and Communication at the University of Leeds. He is the author, coauthor, or coeditor of multiple books and articles on digital journalism, sociology, political communication, and science and technology studies. This entry was posted in Uncategorized on April 20, 2017 by chsims. Feminist technology often refers to technologies that deal with issues of gender and equity. But recently, hackers, scholars, and designers have asked how we would design and create technologies that embody the values of feminism—equity, justice, and social transformation—that anyone can use for any purpose, including research. 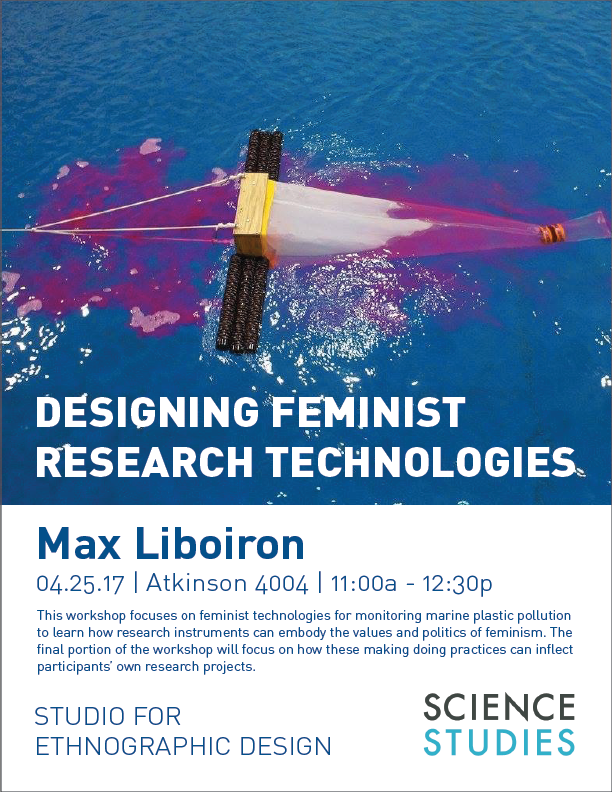 In this workshop, we will apprentice with Dr. Max Liboiron, director of Civic Laboratory for Environmental Action Research (CLEAR), a feminist marine pollution lab in northern Canada. As a case study, participants will design feminist technologies for monitoring marine plastic pollution to learn how research instruments can embody the values and politics of feminism. The final portion of the workshop will focus on how these making and doing practices can inflect participants’ own research projects. Max Liboiron is a scholar, activist, and artist. She is an Assistant Professor in Geography at Memorial University of Newfoundland, where she directs Civic Laboratory for Environmental Action Research (CLEAR), a feminist marine science and technology laboratory that specializes in citizen science and grassroots environmental monitoring of plastic pollution. Her academic work focuses on how invisible yet harmful emerging phenomena such as toxicants from marine plastics become apparent in science and activism, and how these methods of representation relate to action. Liboiron also runs Discard Studies, an interdisciplinary hub for research on waste and wasting. Prior to her position at Memorial, Liboiron was a Postdoctoral Fellow with both the Social Science Environmental Health Research Institute at Northeastern University and with Intel’s Science and Technology Centre for Social Computing. She holds a Ph.D. in Media, Culture, and Communication from New York University. This entry was posted in Uncategorized on April 11, 2017 by chsims. Associate Professor of the Media School, with affiliations in American Studies, Anthropology, and Gender Studies at Indiana University. Humanists’ critically-oriented scholarship has long struggled with when and how to best weave together quantitative and qualitative approaches to lines of inquiry. Even when they could be used to complement each other, computational and critical methodological tools are often positioned as “at odds” with or epistemologically antithetical to each other. While methodologies always hinge on the research question at hand, there are few questions about the social, cultural, economic, or political implications of “the Internet” that can afford to ignore either the “big data” produced by social interactions online or the everyday engagements and social contexts that make those interactions socially meaningful. Rather than assume that quantitative measurement and qualitative, critical interpretation are epistemological chasms, what could it look like to bridge computational and qualitative divides? This workshop draws on the presenter’s multi-year, multi-modal study of crowdsourcing—calls for work, distributed online, through an API—as a form of employment to examine strategies for investigating ethnographically rich, data-intensive problems. 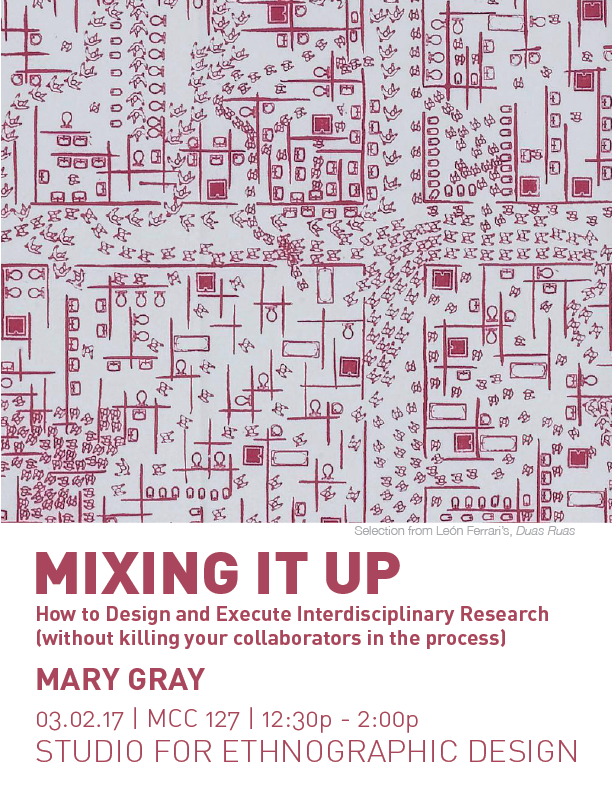 Research questions, like “How is the nature of work changing through new forms of digital disaggregation and distribution?” require not only sifting and sorting through massive amounts of data but also iterating between them and people’s everyday experiences of these information and computational systems. We examine ways to effectively and rigorously extract, interpret, and learn from very large datasets and put them in conversation with surveys, participant-observation, ethnographic interviews and fieldnotes, that require new approaches to collaborative research and theory-building. Mary Gray is the author of In Your Face: Stories from the Lives of Queer Youth (Haworth Press, 1999) and Out in the Country: Youth, Media, and Queer Visibility in Rural America (NYU Press, 2009). She received her PhD from the Department of Communication at University of California, San Diego. This entry was posted in Uncategorized on February 23, 2017 by chsims. 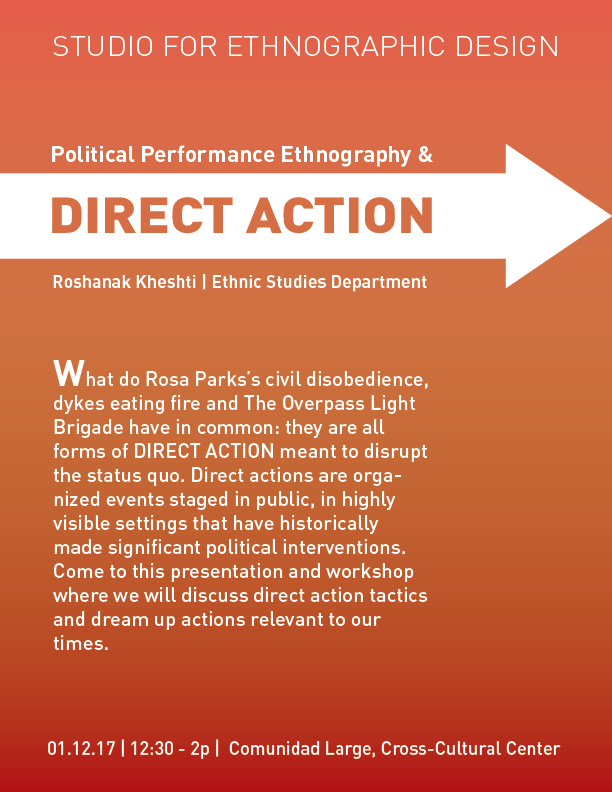 Join Associate Professor Roshanak Kheshti of the Ethnic Studies Department for a discussion and workshop on ethnography and direct action. This entry was posted in Uncategorized on January 5, 2017 by chsims. The annual SED Open House will be held from 4-6p on Tuesday the 29th. 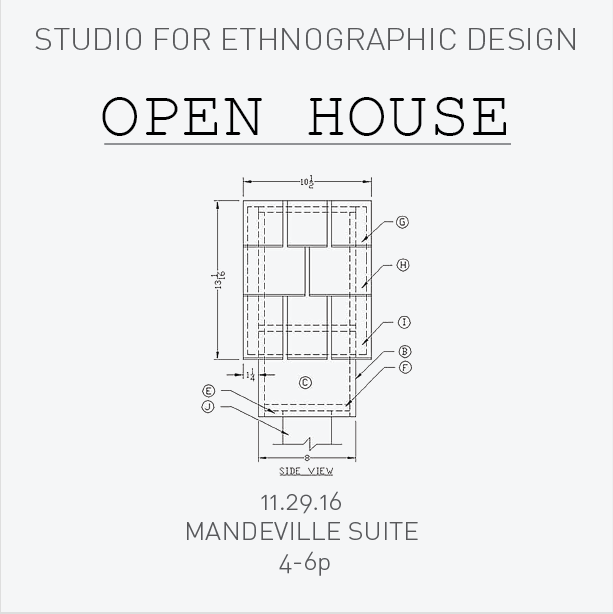 Like last year, we’ll be holding the Open House in the Mandeville Suite, which in on the 11th floor of Tioga Hall in Muir College. Come to meet faculty and graduate students who are interested in ethnography and to hear about SED’s plans for the winter and spring quarters. Amongst other things, we plan to offer programming that explores the intersection of ethnographic practice and political engagement, broadly construed. Second, starting this January SED will be sponsoring an Ethnography Practicum. 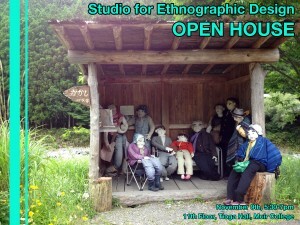 The practicum is for graduate students and faculty who are currently working — at any stage — on an ethnographic project. It is a chance to workshop aspects of your project and to learn from fellow practitioners. The practicum will meet once a month throughout winter and spring quarters. Each month different faculty will be invited based on the issues or dilemmas that students want to address at that month’s meeting. Students can receive course credit (pass/no-pass) for the practicum by enrolling in ANTH 287, COGR 285, or ETHN 287 for the spring 2017 quarter. To receive course credit a student will need to attend the six practicums as well as 4 SED programming events over the span of the winter and spring quarters; exceptions and accommodations can be made for extenuating circumstances such as conference travel, job interviews, health issues, and so forth. Please note that the ethnographic practicum is meant as a supplement, not a replacement, for the ethnographic methods courses offered by various departments. This entry was posted in Events on November 29, 2016 by chsims. Thursday June 2nd – Year End Open House. 5:30-7:30pm, SME 408. Come help us celebrate this past year and look forward to the next! Refreshments will be served. January 14th – Carceral Societies: Victor Rios (UCSB) – 12:30-1:45pm, Informal Lunch Discussion on methodology 2-3. January 29th – Infrastructures: Hannah Appel (UCLA Anthropology), Akhil Gupta (UCLA Anthropology), race and infrastructure working group – 1-3pm, SME 408. February 8th – ROUNDTABLE DISCUSSION. Digital Practice: Doing Work – ethnographic, artistic, political, and otherwise – about and through the Internet. With Gabriella Coleman (McGill University), Chris Kelty (UCLA), Roderic Crooks (UCLA), Ricardo Dominguez (UCSD). 3-5pm, SME 408. April 25th – “La Racha: Speed and Violence in Tijuana” – A discussion of a paper by Rihan Yeh (El Colegio de Michoacán) – 12-2pm, SME 408. 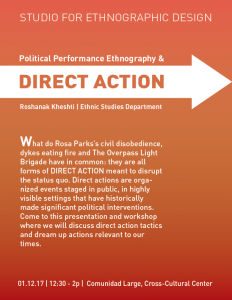 April 27th – Performance Ethnography Lab III: An Archaeology of Multi-Media: Studies in Materiality and Form – Roshanak Kheshti (UCSD Ethnic Studies) discusses new work – 12-2pm, SME 408. 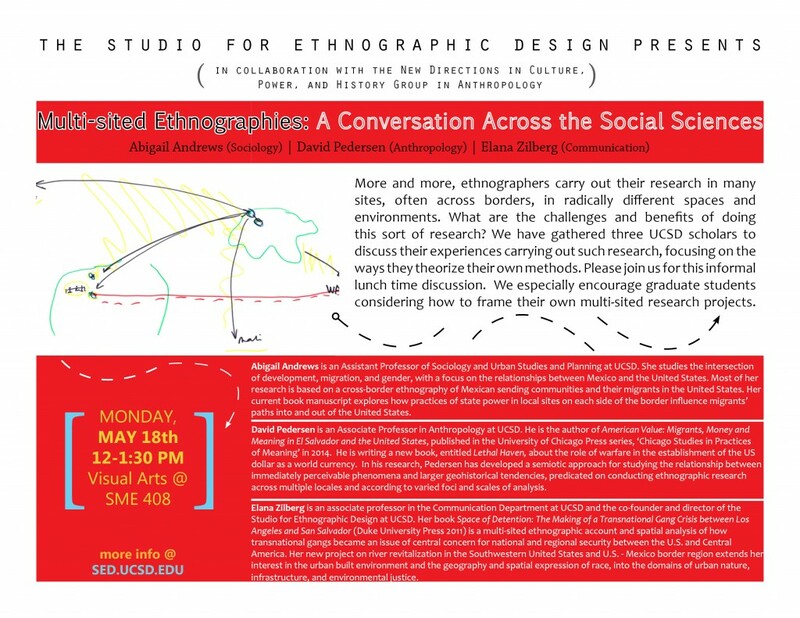 May 6th-7th – Seminar on Sensory Ethnography: Kathleen Stewart (UT Austin), Marina Peterson (Ohio University), Lesley Stern (UCSD), Cristina Rivera-Garza (UCSD) and Katrin Pesch (UCSD). Friday May 6th from 2:00 p.m. – 5:00 p.m. in SME 408. Download the seminar readings here. This entry was posted in Events on December 9, 2015 by chartblay. Please join us on November 9th, 5:30-7pm, for a SED Open House. There will be light refreshments, a touch of feminist theory theater, opportunities to interact with fellow SEDistas, and a run-down of our upcoming events for the year. This entry was posted in Events on October 27, 2015 by jdhankins. 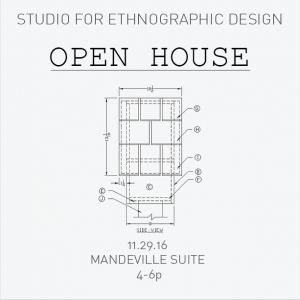 Join SED for a discussion on multi-sited ethnographic research design co-hosted with the New Directions in Culture, Power, and History Group in Anthropology. More and more, ethnographers carry out their research in many sites, often across borders, in radically different spaces and environments. What are the challenges and benefits of doing this sort of research? We have gathered three UCSD scholars to discuss their experiences carrying out such research, focusing on the ways they theorize their own methods. This informal lunch time discussion will enact a conversation about ethnography, the challenges and possibilities of multi-sited research across the social sciences. Graduate students considering how to frame their own multi-sited research projects are encouraged to attend. Abigail Andrews is an Assistant Professor of Sociology and Urban Studies and Planning at UCSD. She studies the intersection of development, migration, and gender, with a focus on the relationships between Mexico and the United States. Most of her research is based on a cross-border ethnography of Mexican sending communities and their migrants in the United States. Her current book manuscript explores how practices of state power in local sites on each side of the border influence migrants’ paths into and out of the United States. It then considers how migrant communities respond to exclusion and exploitation, sparking new forms of cross-border political advocacy. In this work — and following the interactions across transnational migrants communities — Professor Andrews grapples with the question of how power and politics operate across place. David Pederson is an Associate Professor in Anthropology at UCSD. He is the author of American Value: Migrants, Money and Meaning in El Salvador and the United States, published in the University of Chicago Press series, ‘Chicago Studies in Practices of Meaning’ in 2014. He is writing a new book, entitled Lethal Haven, about the role of warfare in the establishment of the US dollar as a world currency. In his research, Pedersen has developed a semiotic approach for studying the relationship between immediately perceivable phenomena and larger geohistorical tendencies, predicated on conducting ethnographic research across multiple locales and according to varied foci and scales of analysis. Elana Zilberg is an Associate Professor in the Communication Department at UCSD and the co-founder and director of the Studio for Ethnographic Design at UCSD. Her book Space of Detention: The Making of a Transnational Gang Crisis between Los Angeles and San Salvador (Duke University Press 2011) is a multi-sited ethnographic account and spatial analysis of how transnational gangs became an issue of central concern for national and regional security between the U.S. and Central America. Her new project on river revitalization in the Southwestern United States and U.S. – Mexico border regions extends her interest in the urban built environment and the geography and spatial expression of race, into the domains of urban nature, infrastructure, and environmental justice. This entry was posted in Events and tagged borders, migrant communities, multi-sited on May 11, 2015 by caushana.